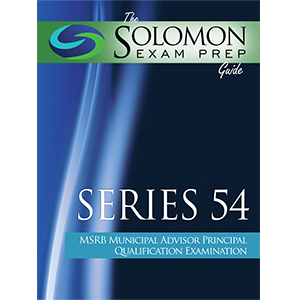 The Solomon Exam Prep Guide to the Series 54 offers a comprehensive guide to the MSRB Series 54 Municipal Advisor Principal Qualification Examination. Municipal advisor principals—those who engage in the management, direction or supervision of the municipal advisory activities of the municipal advisor and its associated persons—must pass the Series 50 exam prior to taking the Series 54 exam. Written in clear English and offering practice questions with detailed explanations, stimulating exercises, and visual aids sprinkled throughout the text, the Solomon Exam Prep Guide will get you on track to learning the content necessary to pass the Series 54 exam. The Solomon Series 54 exam study guide is available as an online digital manual via your online student dashboard (requires Internet connection/not downloadable). Why do I have to take the Series 54? firm is as culpable as the rule violator for “failure to supervise.” To make sure that principals are up to the task, Municipal Advisor Principals must be able to show mastery of municipal advisory knowledge and, especially, municipal advisor regulations—which is why you are required to study and pass the Series 54. The buck has to stop with someone, and if you pass the Series 54, that someone will be you. What does a Series 54 license allow me to do? What is the Series 54 pilot exam? The pilot exam is a precursor to the Series 54 permanent exam, and it gives the MSRB an opportunity to try out its exam questions and determine a passing score for the exam. The pilot exam will be administered from March –July 2019. When will the permanent Series 54 exam be available? The MSRB has stated that the permanent Series 54 exam is expected to be available sometime in the fall of 2019. If I pass the pilot exam, will I have to take the permanent exam as well? No, a passing score on the pilot exam will qualify you as a Municipal Advisor Principal. What happens if I don’t pass the Series 54 pilot exam? If you fail the Series 54 pilot exam, you must wait to take the permanent Series 54 exam when it becomes available. What score do I need to pass the Series 54 pilot exam? The Series 54 exam is made up of 110 multiple-choice questions covering all three sections of the MSRB exam outline. One hundred of the questions are scored, while 10 questions are unscored. The unscored questions will be randomly distributed throughout the exam and do not count for scoring purposes. What subjects does the Series 54 pilot exam test? How do I enroll to take the Series 54 pilot exam? Your municipal advisor firm must use FINRA’s Test Enrollment Services System (TESS) to enroll you in the Series 54 pilot. Once your exam enrollment request has been processed by FINRA, FINRA will send you an email notification, allowing you to schedule an appointment with a Prometric testing center. You must schedule a time to take the Series 54 pilot within your 120–calendar day enrollment period. How do I schedule an appointment with a Prometric testing center to take the Series 54 pilot? I passed my Series 65 today with an 80, first effort! Not only was the material well laid out, but if it's possible, the Solomon prep made the material palatable and understandable. Amazing!!! I have used Kaplan in the past as well as STC, which are both very good, but I chose Solomon because it had audio downloads. With an hour commute, I was able to study during that otherwise wasted time. Additionally, the "Ask the Professor" and live chat features were excellent!! Questions were answered virtually immediately by personal email from author/owner Jeremy Solomon and he actually called me to help me and cheer me on! I didn't think this kind of customer service and general human kindness existed anymore. He even asked me to let him know personally my results which, thanks to this program, I am on the other side of this very difficult exam. Thank you Solomon Exam Prep!!!! !